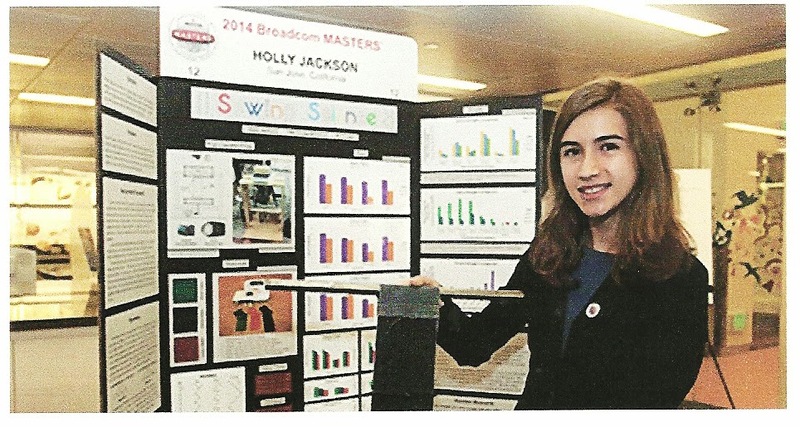 On Tuesday, October 28, Broadcom Foundation and Society for Science & the Public announced the top winners of the 2014 Broadcom MASTERS. Holly Jackson, 14, of San Jose, Calif., won the $25,000 Samueli Foundation Prize in honor of overall STEM excellence and for her study on the strength and best application of stitches in sewing.
" Grand prize winner Holly Jackson has loved to sew since the fourth grade, when she learned to construct dolls and and clothing." Her research involved testing the tensile strength of various threads and their best applications. Tensile strength is defined as the measure of the ability of fiber, yarn or fabric to resist breaking by tension. It is expressed as pounds per inch (or grams per denier). Tensile strength, as a characteristic property of each unique fiber, varies greatly. Silk, for instance, has a significantly high resistance to breakage. Spider silk filaments have a tensile strength that a cord of spider silk, the diameter of a pencil, is said to be able to stop a 747 airplane in flight. Polyester filaments, as Holly found, are significantly weaker, as any home seamstress can attest. Her further research involved the application of sewing stitches. Various types of interlocked stitches ( 2 threads, think of your sewing machine with a top as well as a bobbin thread which interlock) were tested, including straight, zigzag and stretch. On average the straight stitch proved to be the strongest. It is vitally important that students interested in the textile industry realize the concepts of using sustainable fibers, industry safety standards and the use of improved technology. While economic considerations have resulted in the exportation of the US textile industry to overseas venues, it is recognized that such cost-saving measures often result in an inferior final product, and the exploitation of textile factory workers. If the US is to regain a position in the world of manufactured textiles, we must educate young scholars. Congratulations, Holly!!! Broadcom Foundation sponsors the Broadcom Masters, a program of The Society for Science and the Public. It is a competition of science and engineering for middle school children. The foundation's mission is to advance education in STEM: science, technology, engineering and mathematics. Founded in 19212 Society for Science and the Public is a nonprofit organization dedicated to the achievement of young researchers.